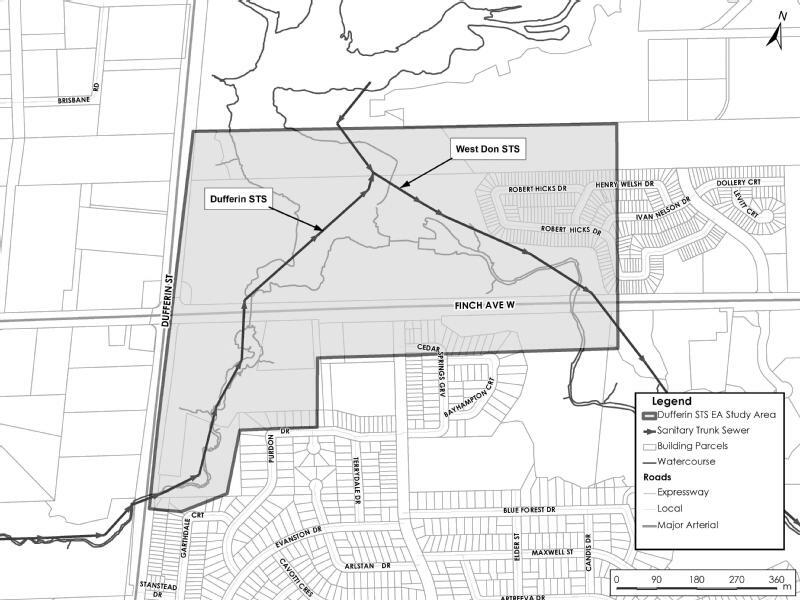 The City of Toronto has completed a Municipal Class Environmental Assessment (EA) Study to address problems and opportunities with the Dufferin Sanitary Trunk Sewer (STS) in the Dufferin Street and Finch Avenue West Area. The objective of the study is to provide recommendations for the possibility for rehabilitation and/or relocation within the study area. Rehabilitate the existing Dufferin STS south of Finch Ave. W.
The study was carried out following the requirements for Schedule B projects under the Municipal Class EA process. A Project File Report was placed on public record for a 30 day review period starting April 26, 2018 and ending May 28, 2018. The 30 day review period is now complete. Built in the early 1960s, the Dufferin STS is part of the City’s Don Sanitary Trunk Sewer Collection System. Sections of the Dufferin STS in the Dufferin Street and Finch Avenue West area are located under the G. Ross Lord Reservoir, which was built in 1973 to reduce the risk of flooding to downstream communities. As a result of the Dufferin STS’ deterioration over the years and its alignment under the reservoir, there is a significant amount of infiltration and inflow of stormwater into the trunk sewer and there are trunk sewer sections and manholes that are inaccessible for maintenance, which poses operational challenges. Please join us at a Public Drop-in Event for the Dufferin Sanitary Trunk Sewer (STS) System Improvements Municipal Class EA Study. You will learn about the study’s problems and opportunities, the options considered, and the recommended system improvements for the Dufferin STS within the study area (see study area map). Thursday, December 7, 2017 from 6 p.m. to 8 p.m.
A Public Drop-in Event for the Dufferin Sanitary Trunk Sewer (STS) System Improvements Municipal Class EA Study was held on December 7, 2017. The public was given the opportunity to learn about the study’s problems and opportunities, the options considered, and the recommended system improvements for the Dufferin STS within the study area.This EA study / PIE does not address basement flooding. To request assistance reading the above files, please email or contact Khatija Sahib at 416-392-2962 / Khatija.Sahib@toronto.ca. The study was carried out following the requirements for Schedule B projects under the Municipal Class EA process. A Project File Report was placed on public record for a 30 day review period starting April 26, 2018 and ending May 28, 2018. The 30 day review period is now complete. To request assistance reading the Project File Report below, please email or contact Khatija Sahib at 416-392-2962 / Khatija.Sahib@toronto.ca.